Special services operate from Sunshine City to Prince of Wales Hospital at 08:30 on Mondays to Fridays (except public holidays). Special services operate from St. Francis Church to Prince of Wales Hospital at 08:30 on Mondays to Saturdays (except public holidays). 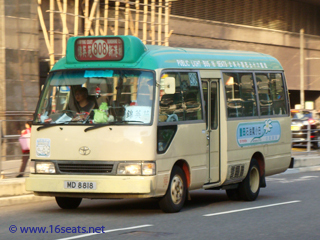 From 28 May 2018, low-floor minibus service is introduced on this route. Each departure will carry one wheelchair passenger. Reservation on wheelchair spaces is available through the operator's hotline at 9163 8589 between 14 days and one working day before the departure date. The wheelchair passenger may request to take the service with one companion in the reservation call. The above timetable is published as a guide to the general level of service. It is subject to change according to traffic conditions without prior notice. 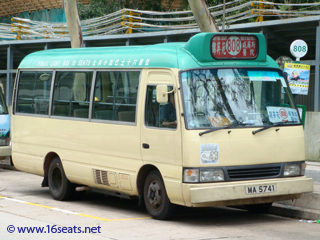 This is a charter service operating as MOSTown Free Shuttle Bus Service (Kam Ying Court Route) and observing designated stops for pick-up and drop-off. For service details and ticket redemption, please refer to the mall website. Passengers should present valid Single Tickets or Monthly Passes of MOSTown Free Shuttle Bus Service for boarding.